Duck Lake is a beautiful, private area in Muskegon County Michigan that is known for it’s beaches, state park, and channel to Lake Michigan. The gorgeous views, acres of state park forest, and family friendly beaches and recreation areas make this a perfect place to call home or vacation for the summer. Duck Lake is small, secluded lake in Whitehall, MI just south of White Lake. This lake is great for family swimming, boating, and recreation because of its privacy. The northern side of the lakefront is part of the expansive Duck Lake State park thus limiting the number of homes on the lake. The size of the lake is perfect for waterskiing, tubing, and family fun. This combined with the excellent location and high performing Whitehall school district makes it a great place to raise a family. The breathtaking views of the sunset and unique access to the state park and Lake Michigan make it an ideal place to own a cottage or vacation home. 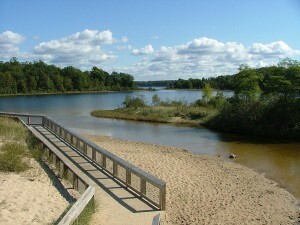 The Duck Lake State Park is one of the most unique parks in West Michigan occupying 728 acres in Whitehall along Scenic Drive. The Duck lake and Lake Michigan waterfront land was purchased from a nature conservatory in 1974 and formally turned into a state park in 1988. The park boasts charming picnic areas, over almost a mile of paved walking trails, miles of walking trails through the lush forest, and a massive sand dune that is fun for the family to climb and run down to the lake. In addition to its charm and picturesque views of the park, waterfront homeowners can enjoy access to the Duck lake channel. 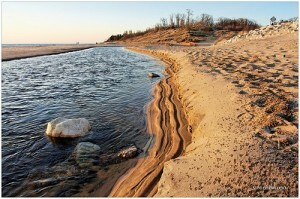 This water way runs through the beach area of the park and changes every year with the currents. 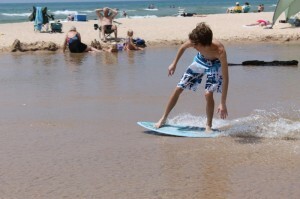 Its slow moving and very shallow waters makes it perfect for small children, families, and skim boarding. It’s truly a natural local landmark. The White Lake Yacht Club is a favorite spot for many locals and is a stone’s throw away from Duck Lake waterfront properties. Founded in 1903, this historic club is next to a private golf course and home to sailing lessons, member events, and other fun activities. A few minute walk from the lake is Michillinda Beach Lodge, a historic hotel and resort. Built in 1894 on a bluff overlooking beautiful Lake Michigan, the resort is full of character, history, and breathtaking views. The grounds have a swimming pool, mini golf course, and many other activities. The Duck Lake area is a short drive from the White Lake Pier Lighthouse located on the channel that connects Lake Michigan to White Lake. This historic lighthouse was built in 1875 to provide incoming ships direction and navigation. Today the attached museum is both full of history and fun. Are you interested in looking at more homes on Duck Lake, feel free to take a look at our Duck Lake listings page to find out what is currently available. If you’d like more information about a property or see one for yourself, please let us know by filling out our contact form or giving us a call. We would love to set up a showing with you today.